Montana People’s Action | Building Websites for the People! My very first website had a tables-based layout, using HTML that I wrote in Notepad. 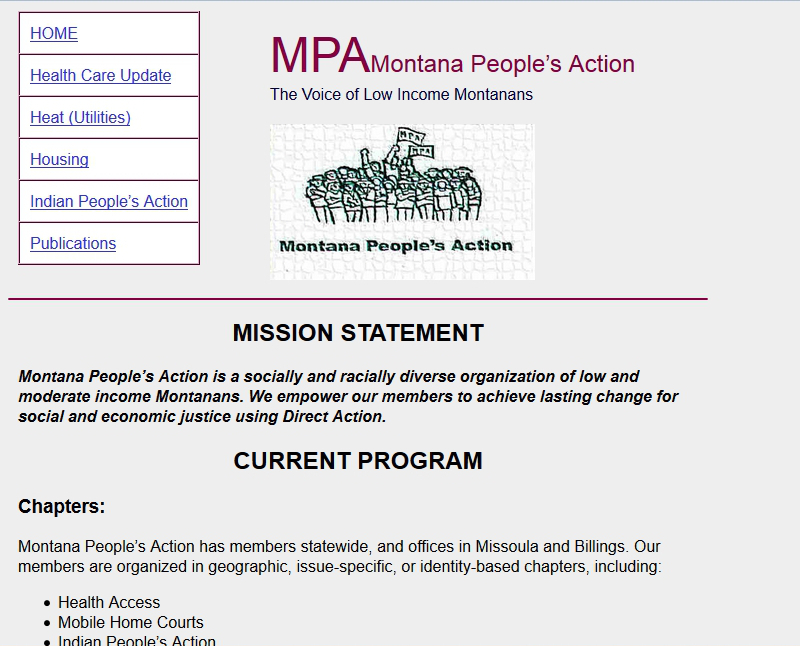 It was a subtle redesign of the homepage for Montana People’s Action, a low-income grassroots membership-based organization that fought for social and economic justice issues. This is a screenshot of the first website I ever made. It served as the homepage for Montana People’s Action and ran 2004-2007. One reason tables-based layouts should be avoided is because managing a series of nested tables gets increasingly complicated. Not only is the practice considered non-accessible, but it is inefficient and unnecessarily difficult to maintain. Reworking the website for Montana People’s Action in 2004 was a great confidence-builder for me and pointed the way toward me learning about CSS for keeping presentation rules apart from the content itself. This entry was posted in Portfolio and tagged Montana People's Action.